Ken Aucremanne at North Bennet St. School. Tuesday I had lunch with Ken Aucremanne (pronoununced "ockerman"). Ken is a 6-year US Navy veteran from West Virginia who's in the process of starting VetWoodworks, a charitable non-profit organization to promote woodworking for veterans. Like me, he's concerned to see veterans suffering from unemployment, depression, substance abuse, homelessness, and worse. We both see woodworking as a way to provide veterans with vocational training, a hobby, or just a few hours of relaxation. Sometimes it's nothing more than what I call therapy shavings. No need to build anything, just enjoy the pure satisfaction of turning a piece of wood into a pile of shavings. 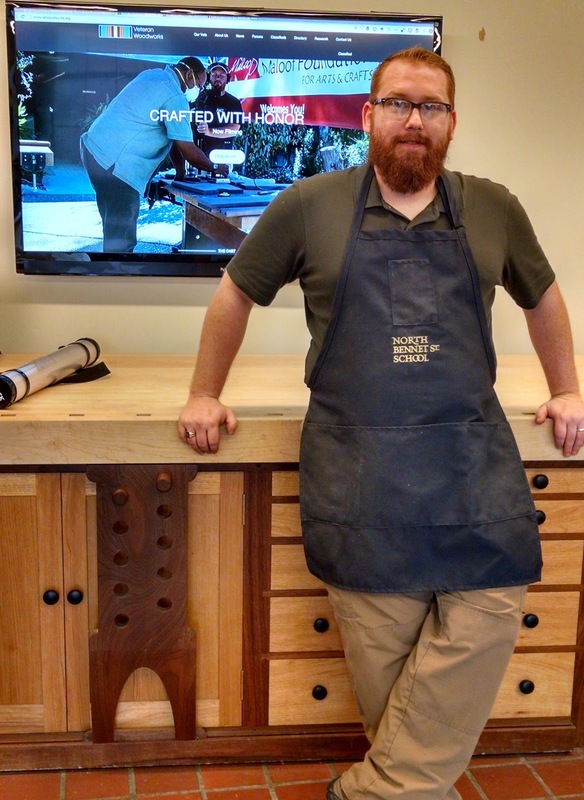 Part of his effort involves traveling the country making a documentary film about woodworking programs for veterans. He's currently in a 3-month furniture making intensive course at Boston's famed North Bennet St. School. NBSS has an active Student Veterans Organization (NBSS SVO). It turns out my new job is just a 10-minute walk from NBSS. Ken contacted me following up on a comment I had put on this article about him on the Woodcraft Magazine Staff Blog. When I found out he was so close, I suggested we meet and talk about it. Ken's still working out all the details of the organization, the program it will follow, the website, and the documentary (just a few things to keep him occupied!). For starters, he's created the VetWoodworks.org Facebook page. His contact info is on the page's About tab. On Wednesday, he invited me to attend the presentation he was giving at NBSS to the SVO. He showed a brief video about the Sam Maloof Foundation's work with veterans, and very kindly held up my JOTMOST program as an example of what he was talking about. His goal is to secure sponsorship funding and register VetWoodworks as a 501c3 organization. It will provide tools for veterans' programs around the country, and a network of volunteer instructors such as myself. He's in the process of contacting potential sponsors. If your company or organization would like to help, contact him directly. I'll post updates on this as further details become available. Among other things, two that will be needed are tool donations and volunteer instructors. The 501c3 status will make donations tax-deductible. I'm very happy to join up with Ken because the biggest challenge I've faced is outreach and getting participants. I've contacted several agencies and organizations, but with no response. He told me the VA is very reluctant to deal with anyone who's not a 501c. I first became interested in teaching basic hand tool usage when I kept reading in Mike Dunbar's articles that chairmaking students would show up at his Windsor Institute with tools they didn't know how to use, and weren't sharp or ready for use. He would have to spend a day of valuable class time getting them prepared. Since I had recently climbed that learning curve myself, I felt I could fill that niche. That's the basis of what I teach, to bootstrap aspiring hand tool woodworkers and give them the basic level of competence, confidence, and versatility to take more advanced classes. Part of the message I want to convey is that it doesn't take a huge amount of resources to set up a suitable workshop. An investment of $200-$500 is enough to equip it with used hand tools, or $500-$1500 for new tools. Building a small workbench with some kind of workholding setup takes $50-$200, or buying one takes $500-$1500. While most people envision a large workspace with big power tools making lots of noise and sawdust, you can put together a perfectly good hand tool workspace with a 4'x2' shop-made folding workbench and shop-made footlocker-sized box of tools. This requires minimal space both in use and folded up, is quiet, and produces only a small mess that's easily swept up. A 6'x4' corner of a room is all it takes. Put a dropcloth down for even easier cleanup. For anyone interested in assembling such a workspace, the following minimum inventory of tools per workbench is sufficient to work on a wide range of projects. Tools can be new or antique as long as they are of good quality. The very act of gathering and preparing these tools and building the shop-made items is an excellent learning experience. Bench chisels in sizes from 1/4"-3/4"
There are of course many other tools, both hand and power, that can be added to this to extend the range of choices. For instance, Ken would add a shoulder plane and a brace and bits. Then the most critical things are the skills to sharpen, maintain, and use these tools, and the ability to teach those skills to others. When you keep your tools ready to use, it's much easier to learn new skills, and the work is intensely satisfying. Good tools, good maintenance, good instruction, and good practice make for good results. For another perspective on the tool list, including some additions, see Evaluating The Tool List By Function.